See 1st hand the visual effect 4 years of this pompous would-be-king has had on Europe. 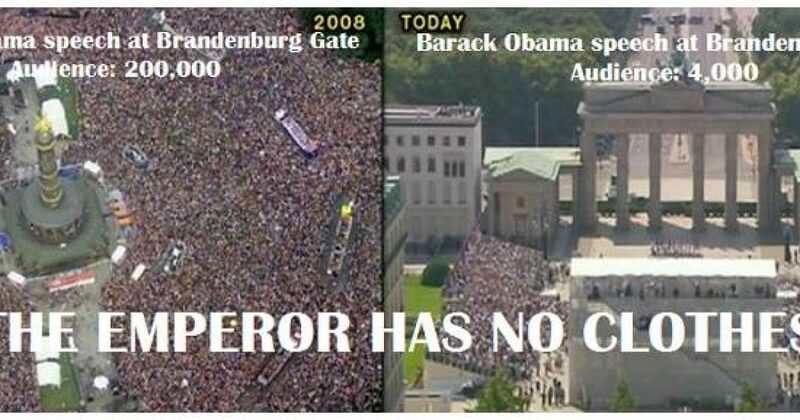 Yes, in 2008 Obama was greeted by 200K cheering Germans warming his pride with absolute adulation. This time around the crowd count was a meager and subdued 4,000. The world has seen Obama in action, or rather inaction, for 4 years and is not impressed. Europe has seen the American president fail Protocol 101 in every country except the Muslim strongholds where he bows and ingratiates himself. The temps soared yesterday and Obama found himself giving an Albert Brooks-like performance, casting off his coat jacket only to sweat through his shirt. It seems the only warmth that greeted BHO at the Brandenburg Gate was the soaring temps. Maybe he should call his buddy Al Gore about that?